Sorry meatloaf, you're getting the inside photo and these gorgeous turnips are getting front page. In Saturday night's dinner, comfort was the key and the side dish took the lead. I didn't think I'd ever hear my husband say that he'd eat truckloads of turnips, but it happened. Here's the deal - I had two bunches of hakurei turnips leftover from the past two weeks of my Winter CSA shares from Heron Pond Farm. I'd look at them when I opened my produce drawer, wondering what in the heck to do with them. By the way, this is going to happen when you get any type of CSA share. There, inevitably, will be some veggies or fruits you'll look at and wonder how you're going to work them into your meal plan. That's half the fun of this journey right? So, Saturday nights when the weather turns chilly and the sky turns gray, my husband and I usually end up staying in, and some kind of comfort food, some kind of red wine ends up on the coffee table as we snuggle in with the pugs for movies and hockey. The meatloaf was a given (and a great recipe by the way), so were mashed potatoes, but I wanted to give these turnips love from a recipe even the pickiest eater could love. A quick Google search came up with this Turnip Gratin from GF-Zing, a gluten-free blogger who modified the recipe from a 2007 one from Gourmet. 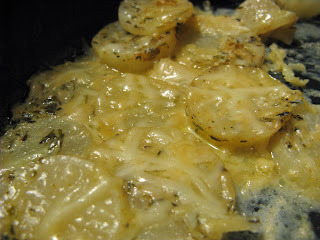 The result was a creamy, peppery amazing dish that has become my husband's new favorite in the house. It paired extremely well with this down-home meatloaf and classic mashed potatoes, and all the main components of each recipe were local. The ground beef and pork came from Tendercrop Farm in Newbury. The turnips and potatoes came from the Winter CSA share we get every week from Heron Pond Farm. 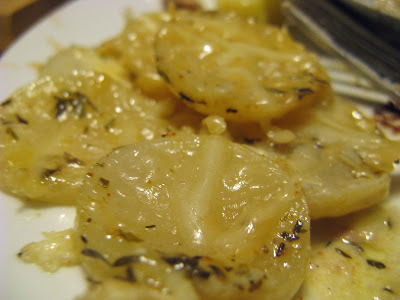 Cut off the top and tail of the turnips, slice into 1/4 inch slices. Melt butter in a non-stick 12-inch skillet (choose one with a lid) and layer turnip slices in pan. Sprinkle the turnips with thyme, salt, pepper, and cayenne pepper. Cook in butter over medium heat for 3 minutes. Cover turnips with the heavy cream and chicken stock, put lid on and cook over medium heat for 20 minutes. After 20 minutes, the turnips will be softened. Sprinkle Parmesan cheese over top of cooked turnips and put lit back on for 3-4 minutes until cheese is melted over the turnips. Serve hot. For the glaze: Mix all ingredients in a small saucepan over low heat until combined, set aside. For the meatloaf: Heat oven to 350 degrees. Heat oil in medium skillet, add onion and garlic and saute until softened, about 5 minutes. Set aside. In a large bowl, mix eggs with thyme, salt, pepper, mustard, Worcestershire sauce, pepper sauce, and milk. Add ground beef and ground pork to egg mixture, and then add parsley, crackers, and the cooked onion and garlic. Mix with a fork or your hands until all combined. Take a meatloaf pan with perforated bottom (you know, the kind that allows the fat to drain out, I really recommend it here), coat with cooking spray, and pour meat mixture in, creating a loaf shape. Take a fork and pull it away from the sides so the fat can drain easily. Brush on 1/4 of the glaze and put in oven and bake for about 45 minutes, until the glaze sets. Top with another 1/4 of the glaze and bake another 15-20 minutes, until the glaze is set and a meat thermometer registers 160 degrees. Take out of oven and allow to cool at least 10 minutes. 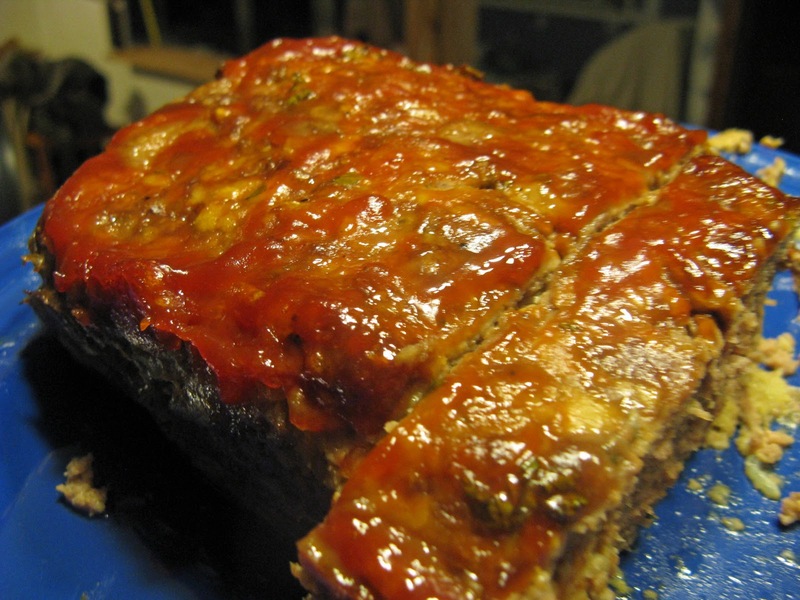 Turn the meatloaf out onto a plate, slice and serve with remaining glaze. I realized in order to be helpful with sharing with everyone how to use their winter shares, I should recap every week where it all went to see how, yes, you can use up all the stuff you get (even the not-typical items). After my mom and I split the share this week, I ended up with: 1 bunch Hakurei turnips, 1 bunch carrots, 1 bunch kale, 1 lb. potatoes, 1 long pie pumpkin, 2 apples, 2 onions, 1 shallot, a red pepper, and 6 ears corn. Hakurei Turnips went into the gratin above. The carrots, well, the husband ate those straight from the fridge as snacks all week. The kale and garlic we got went into Sausage and Kale PenneFresh Pumpkin and Corn Soup. The onions went into a little bit of everything, the soup, the meatloaf and salads. The apples became snacks or part of salads. The rest of the corn, I took it off the cob and froze on a parchment-paper lined baking sheet for about an hour and into a freezer bag I went for soup in the middle of winter.